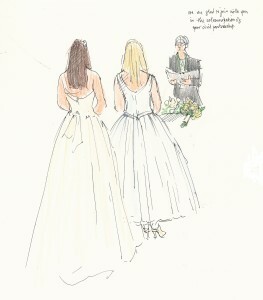 Spring was definitely in the air on Sunday morning when the Guildhall, Bath, held its wedding event. 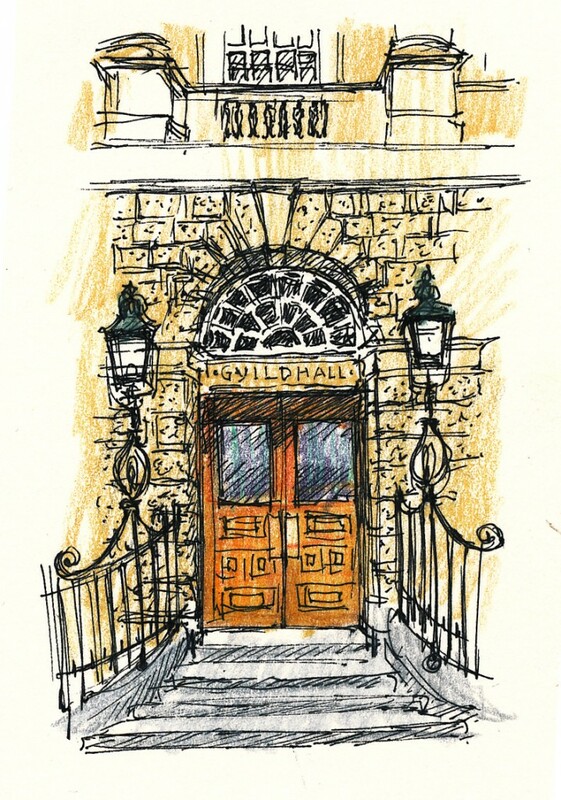 I had visited the Guildhall briefly a few years ago but I had no idea that behind the Georgian façade that is so familiar to visitors to Bath sits a vast and grand interior. It gave a real sense of occasion to sweep up the wide marble staircase and into the Banqueting room, which is breathtaking with its regal portraits, high ceilings decorated with beautiful plasterwork and sparkling eighteenth century glass chandeliers. 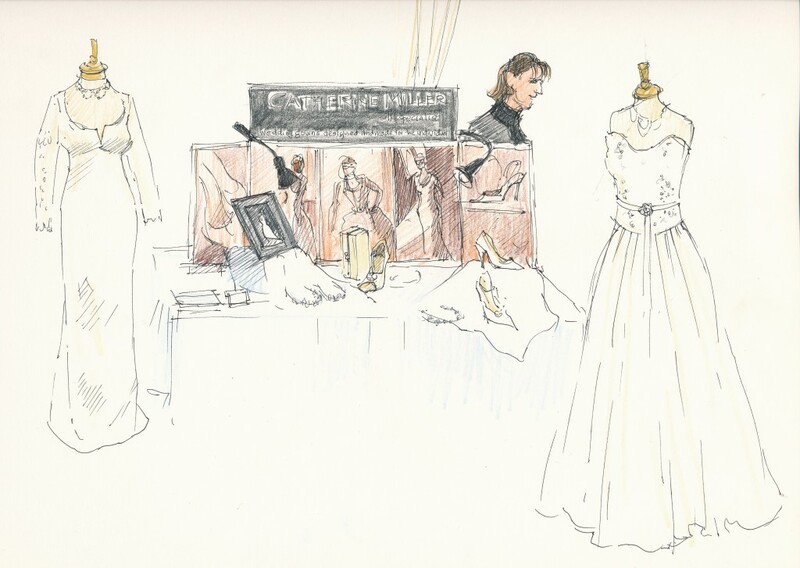 Upstairs in the Banqueting room the first display to catch my eye was Catherine Miller‘s individually designed wedding gowns, where a Bride wearing her own Catherine Miller creation awaited her Groom-for-the-day for the mock ceremony. There has been much talk of this season’s fashion trend for pastel colours, and Jill Jeffries pretty flower display reflected this with fresh, springlike arrangements. 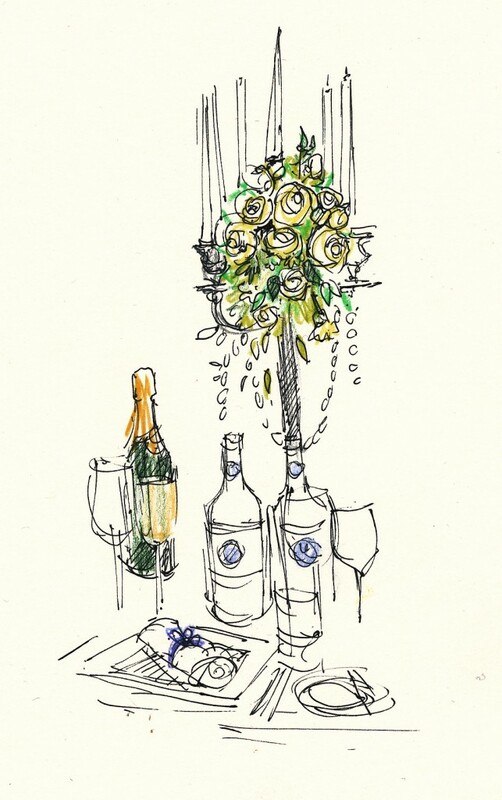 Dine with Style had a table elegantly laid with crisp white linen and the candlestick centre-piece decorated with roses, lysianthus and strings of glass beads. It was delightful to see the smiling face of Trudy Mitchell, the creative talent behind Jellycake. 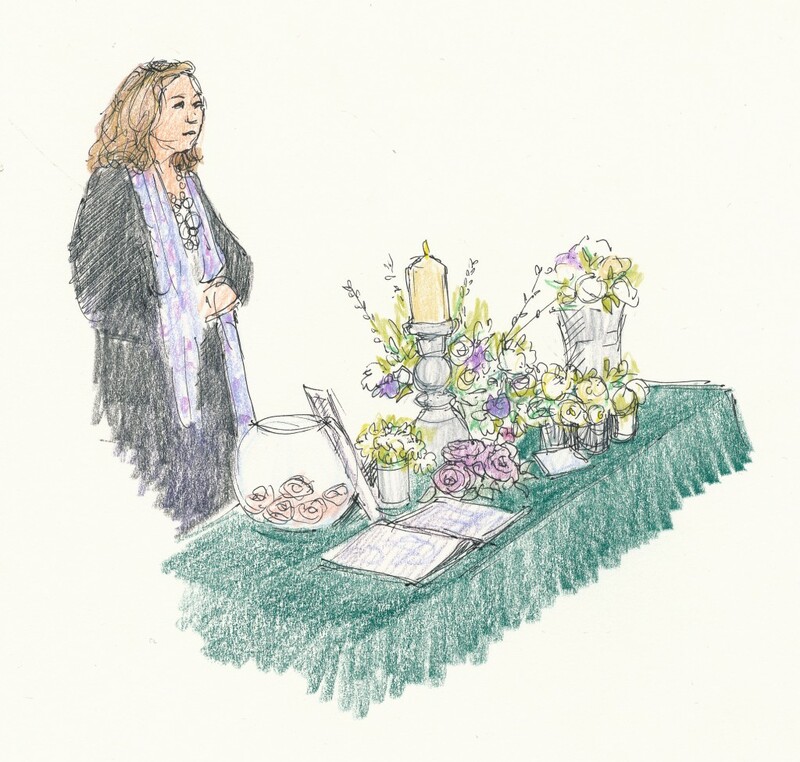 I had met Trudy and her husband, Chris, last Sunday at Bowood’s wedding inspiration day when I had drawn the display from afar – so I decided to zoom in on one of Trudy’s spectacular cakes. 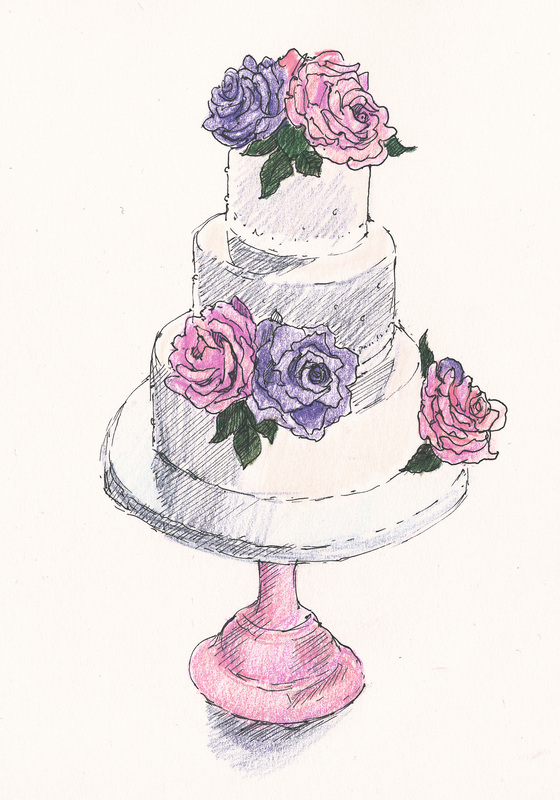 It wasn’t easy to choose which to draw, but in the end it was an elegant three-tiered spongecake with the most intricately sculpted sugarcraft roses. Visitors were greeted by the sweet strains of Classical Wedding Music as violinist, Sara Stagg played a wide repertory of music perfectly suited to the elegance of the venue. 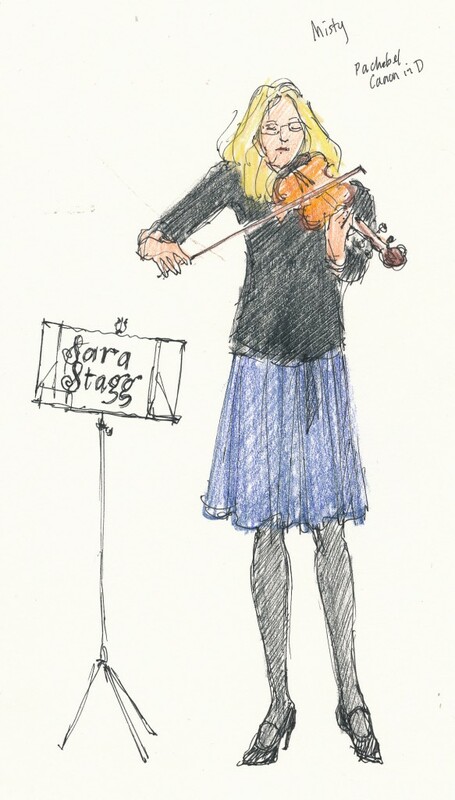 Sara also played at the ‘mock ceremonies’ in the Alkmaar room, with music to set the mood as guests arrived and a fanfare to herald the entrance of the Bride. 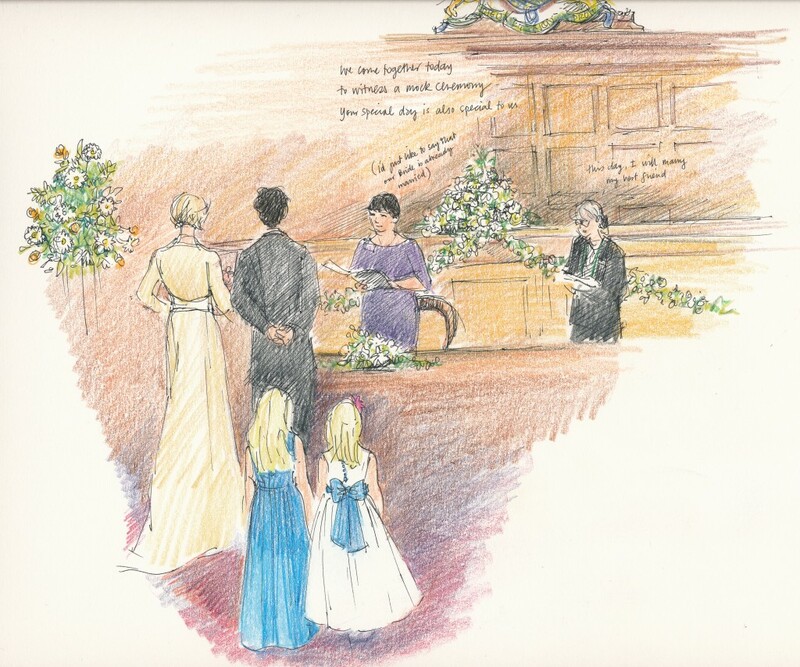 There was a talk by the Superintendent Registrar, Alison Manning, who later introduced and conducted the first of the weddings, emphasising that it was a mock ceremony, and that the ‘Bride’ was already married. The ‘Groom’ looked suitably nervous; I heard later that he had been volunteered to do the honours but hadn’t realised he would have to speak. It must have been a shock to find himself in a registry office in tie and tails with an attentive audience listening to him promise to love and honour a complete stranger for the rest of his days, but the beads of perspiration lent authenticity to the proceedings! The mock Civil partnership followed a similar pattern, but the couple were either very good actresses or knew each other very well; they sailed through their ceremony very much at ease, so both ceremonies reflected just what real wedding days can be like. The ceremonies were complete with bridesmaids and bouquets, and the pretty tiaras and bridesmaids’ bouquets were by iDesign jewellery who use Swarovski crystals and pearls for their handmade, bespoke accessories. 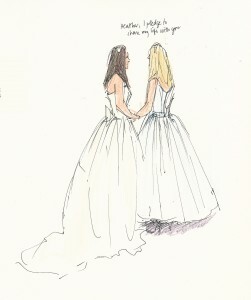 The Civil partnership couple wore contrasting dresses from The Clothes Horse Bridal Room; a corsetted, strapless ivory gown with a sweeping train and a white ballerina style dress which had a real retro feel and gave the bride a chance to show off satin sandals with killer heels. Back in the Banqueting room, I managed to do one last drawing before the event finished. 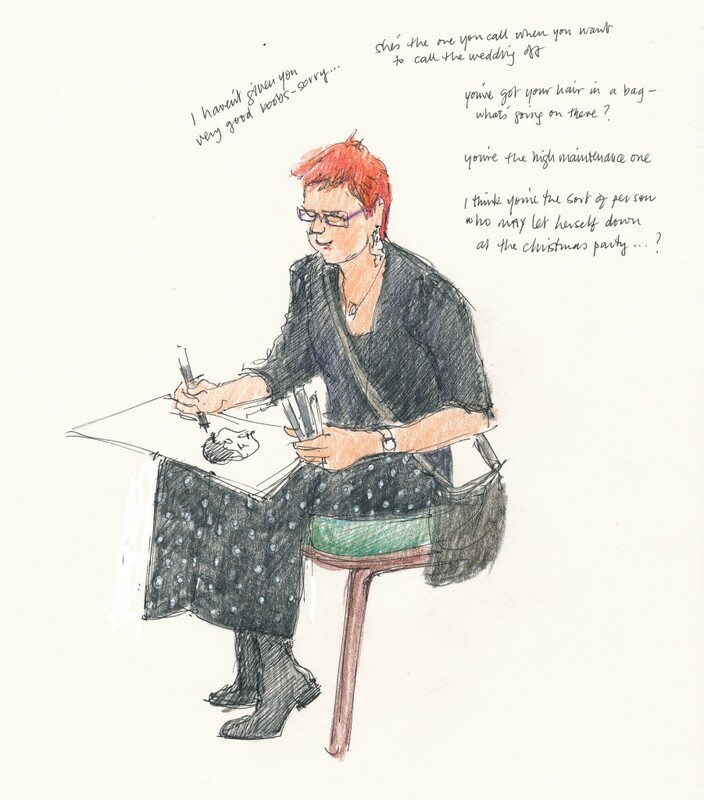 I’d never seen a caricaturist at work before, and it was a revelation to see Sarah Bailey in action. In addition to her skill for humourously representing people, she puts them at ease with her cheeky banter which accompanies each drawing. The observations she made about her sitters were met with whoops of laughter, confirming she’d hit the nail on the head. The Guildhall is a delightful venue for anyone looking to get married in the city. There is also a pretty and intimate room for smaller ceremonies which I was told is especially cosy at Christmas time. It was easy to imagine how festive it would be with the fairy lights and warmth of the decor inside and the Christmas lights of Bath twinkling outside, with the Christmas Market outside Bath Abbey which is in view of the Guildhall. I’ve lived near the city for well over a decade without knowing what treasures were hidden behind the doors of the Guildhall. There are regular events held there – Bath LitFest is coming up at the beginning of March, and Bath in Fashion at the end of the month, so whatever your taste, get a ticket and go and marvel at the wonderful interior.